Geographical Education is the professional journal of AGTA and is on the DEST Register of Refereed Journals. Peer review is only of papers submitted for such review. Reviews and reports are not refereed. The journal was published in print form until volume 25, 2012. 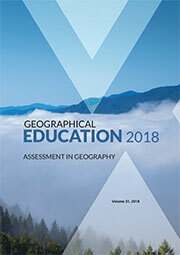 Copies of Geographical Education commencing with volume 26, 2013 are only available in digital format and are available for download. Geographical Education is a refereed journal. Articles submitted to Geographical Education for consideration in the Refereed Articles section are reviewed anonymously by a minimum of two referees. Articles are selected by the Editor based on the outcome of the anonymous reviews and ratified by the the Editor. Authors of accepted articles are sent guidelines for their final submission. Contributions to other sections such as Book Reviews and Reports are not refereed. The ISSN for Geographical Education is ISSN 2204-0242. We invite your participation in producing this journal. Geographical Education encourages school, university teachers and all others interested in geography to share their ideas and experiences in order to promote sound practice, innovative strategies, modern developments and reflection in geographical education. Contributions of varying length are invited, with a maximum of 5000 words for major articles and research reports. Shorter articles of 2000 words, featuring classroom strategies, reflections on particular issues and practices in geography teaching, in-service education workshops and comments on previous articles are especially welcome. Lesson plans, teaching units and how-to-do-it advice on classroom and field skills are also invited as long as they have relevance for a broad range of teachers across Australia. Email: You may care to submit an article for review to the Editor (address below). Please send as a Rich Text File or Microsoft Word document. Word processing: Manuscripts should be word processed and double spaced on one side of white A4 paper, with margins of 2.5 cm on all sides, using 12 point size of Times New Roman (or CG Times) font. Title Page: The title of the article, the name, work position and address of the author (possibly a fax number and/or email address) and an abstract of no more than 150 words should be provided on a title page. Headings: Major and minor sub-headings should be used to guide the reader and to break up the text. Paragraphs: Paragraphs should start without indentation and should be separated by blank lines. All text should be left justified. Quotations: These should be kept to a minimum and where over 40 words should be indented. These must be appropriately referenced. Footnotes: These should be avoided if possible. References: Authors are requested to use the APA (American Psychological Association) style. All references, including World Wide Web, should be provided in alphabetical order, on a separate sheet. The titles of journals should not be abbreviated. Tables and Figures: All tables and figures should be submitted on a separate sheet of paper but with their position indicated on the text by leaving a 3 cm space above and inserting words such as "take in Figure X" or "Take in table Y". All tables and figures (including maps and diagrams) should be submitted in camera-ready form with captions clearly numbered, typed and left-justified below the diagram. Reproduction: Illustrations will be generally reproduced in black and white. Photographs and illustrations should be black and white glossy prints or slides suitable for clear reproduction. Electronic media such as jpeg and gif files should be emailed to the Editor. Copyright of all material published in the journal, Geographical Education, including digital publication in any form is held by AGTA Ltd. AGTA Ltd may determine to make any or all material available to a third party for purposes that AGTA Ltd determines appropriate (such as online distribution of the journal). Authors are responsible for the accuracy of their papers and for obtaining permission to reproduce any material(s) from other publications. Authors may have a self-archived copy of their paper in an electronic repository. That copy should have a copyright notice including full publication details and a link to the url for Geographical Education (http://agta.asn.au/Resources/GeographicalEducation/index.php). Geographical Education is published annually, usually in August. As at least six months are needed for reviewing, editing, design, typesetting and printing, articles should reach the Editor by 30 July. The manuscript should be submitted to the Editor by email. Geographical Education welcomes advertisements for quality publications and services relevant to geography teaching. Please note: Advertising and insert prices are ex-GST and are subject to change without notice. Camera-ready artwork should be delivered by 30 July of the year of publication to the Editor.